These are completely addictive. Don't say I didn't warn you. If you are the treat making and giving kind, I recommend keeping these ingredients on hand. They take very little effort, they make a ton so you will have some leftovers for yourself, and if you slip them into a treat bag or into a nice tin, you have a tasty treat for a friend. 1. Preheat oven to 250-f degrees. Line a baking sheet with foil. Spread pretzels over baking sheet in one even layer. Add one rolo to each mini pretzel. Bake for 4 minutes. 2. 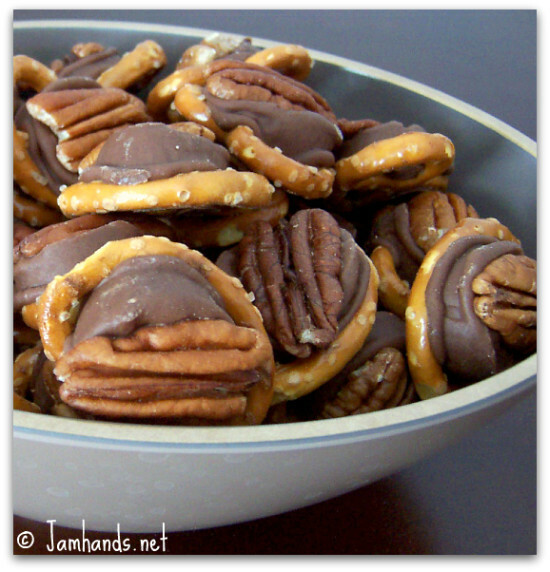 Remove from oven and immediately add a pecan to the top of the rolo, squishing down. Let cool for a few minutes, then transfer baking sheet to fridge to chill for 10 minutes. Remove and store in a sealed container. It has been several years since I first made these and I'm not sure where I got the recipe from originally. All I know is it is all over the internet, so thanks to whomever posted this recipe first. It is awesome! Oh my, I used to LOOOOVE Rolos!!! What a fun recipe. A friend of mine brought these to a party recently. I could not tear myself away! Thanks for sharing! Rolos are my absolute favorite! Can't wait to taste these! I want to fall over down dead over this recipe.